This guide covers features that are only found in the Windows and Android versions of Synthesia. SoundFonts are portable instrument libraries for synthesizers. Starting in Synthesia 10.5, the Windows and Android versions of the app include a new MIDI synthesizer that can use any SoundFont (.SF2) file you like. Some of the popular "General MIDI" SoundFonts are upwards of several hundred megabytes, but they have the potential to make Synthesia's built-in synth sound very nice. Just place your SoundFont (.SF2) files anywhere that Synthesia already searches for music. 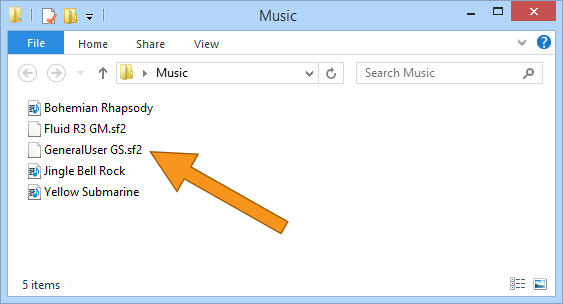 Your "Music" and "Desktop" folders are searched by default and are a good place. For more information, see the Adding songs guide. Head over to the Settings screen and choose the Built-in MIDI Synthesizer from the Music Output list. If your SoundFont is very large (say, more than 100 MB), you may want to consider choosing the Load Sounds on Demand option, which will prevent Synthesia from using an excessive amount of memory. This option may cause the first note played by a particular instrument to fade-in briefly as the sounds are loaded on demand, but it will greatly limit how many sounds are loaded at once. Near the bottom of all the options, there should be a "Sound set" list where you can choose your preferred SoundFont file from the list. If the "Sound set" list doesn't appear, double-check that Synthesia is scanning the location you placed the .SF2 file (under Settings → Songs). The list may also not appear until after the scan for songs has completed. That's it. Try clicking the Test button to hear how that SoundFont will sound. At this point it may be fun to play with the Reverb setting to fine-tune the effects applied to the instruments. Tip: The test on this screen will play whichever song you loaded from the song list most recently. If you'd like to test a particular song against several different SoundFonts, just go to the song list and load it before heading to this screen. Be sure to check our list of Guides for more step-by-step instructions on getting the most out of Synthesia!